Hi. First time user here. map editing isn't my thing and just want to add a location so it shows up on Strava. I tried adding Eric Bike to the local Canasvieiras, Florianopolis, Santa Caterina Brasil map but don't see it on the map now. Ugh. Can someone help? Hi. I'm back with this request. So "Eric Bike" shows up on the Strava web page map. No icon, just the name. Not perfect, but not nothing. Until today, nothing showed on the mobile map. Today, I noticed (for the first time) "Eric Haensel" on my mobile map in the spot where the bike shop is. He's the owner of Eric Bike. It should be "Eric Bike." And an icon would be great. I have no idea what is going on. Can someone help with this? @parkside415: as Harry said, it takes time until Strava refreshes its maps. If you have questions regarding this you need to ask strava. We are OpenStreetMap here and just do the base data - not the strava maps. And maybe you need to clear your strava app's map cache to see the update already. And if strava shows the owner instead of the shop's name, then you also need to ask strava. Look into our data: https://www.openstreetmap.org/node/3882670884 - the name is clearly "Eric Bike". Sorry, we cannot do more from our side. Just a minor hint: could it be that you are just seeing "Eric Haensel" because this is his current position and he shared his position for all strava users? The thing you were missing was... you'd set the name, but need to say what the thing is. 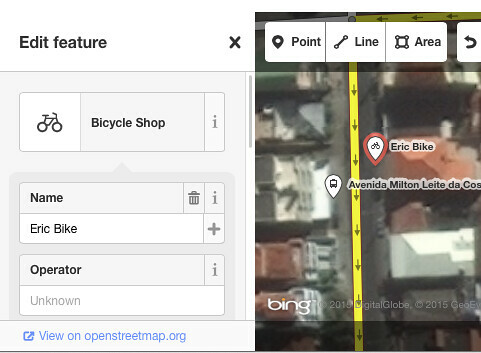 A bicycle shop, by clicking the top type selector bit in the editor. Now that the correct tag is on there, you should find it will appear (after a delay) on the strava maps. It also appears in all sorts of other places, such as OpenCycleMap.org for example, as lots of different people make use of this OpenStreetMap contribution. Thanks for the help. Happy Holidays. Hi Harry. I noticed Eric Bike is now on the Open Street Map. Not yet on Strava. Any idea how long the lag is for Strava? BYW, I am a little confused by all the web sites. Open Street Map, help.openstreetmap, Strava, OSM, etc. I went to the Open Street Map to look for the changes, checked their Help page, but didn't see my original post. There is a wiki link, too. What would it take to a)make the editing simpler and b)streamline the processes/webapages/blogs/helppages to make it easier? I see lots of mistakes on the Open Street Map in just my neighborhood alone. I would gladly make the edits for you but not under present conditions. Happy everything. Like Happy Holidays, but less specific. Sort of a generic "Happy 1/12-31/1" but less precise! @parkside4125: happy … mapping! :-) Welcome! We have many many maps and services using our data and all of these have different update schedules. You need to check at the company strava (or ask them) to get to know when they update and if they show bike shop at all (likely they do...). Why are my buildings not showing up on renderer?